Resume and Cover Letter Guidelines | Colorado Mesa Univ. The resume is your marketing tool for getting the interview. This is the employer's first impression of you, so it needs to be excellent! Being a summary of your employment qualifications, a resume should highlight your education, experience, skills, and other relevant information. Use Optimal Resume Service and see our tips below to aid you in creating your resume. If you would like more feedback on your resume, make an appointment with a career specialist by calling 970.248.1404. Like your resume, your cover letter is an important self-marketing tool, and is the first impression you will make on a potential employer. The functions of a cover letter are to demonstrate a fit between you, the company, and position; to show that you can contribute to the organization as a whole; and to convince the employer to offer you an interview. Learn about tips on creating a cover letter below. To make an appointment to have a career specialist review your cover letter, call 970.248.1404. Used most frequently and is preferred by employers. This format presents information in reverse chronological order (most recent first). Concentrates on skills developed through education or work experiences. This is done by listing the skills you have and documenting specific examples of how you utilized those skills. Use caution when preparing this type of resume as many employers are somewhat suspicious of resumes without specific dates. This resume combines the first two types and can be used to effectively present your qualifications. The combination resume will not only highlight your skills, but will also provide employers with the expected chronological format. CMU Students: build your resume using our Optimal Resume Service. Review our Nuts and Bolts handout and the sample resumes provided in above section. Keep font between 10 - 12 point. Resumes should be appealing to the eye and allow the employer to quickly retrieve information. Use bullets to effectively present your information-do not write in paragraph format. Print references on separate page. 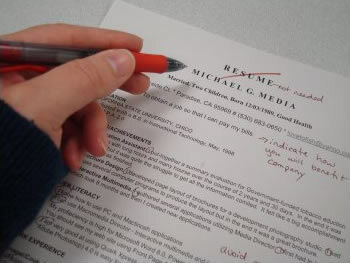 Use same paper as your resume and cover letter. Use the same heading on this page as you have for you resume and cover letter. Indicate reference list with a sub-heading like "References" or "Professional References" at the top. name, title, organization, complete address and telephone number. fax numbers and e-mail addresses are optional. Good references are people who are professional and in positions of responsibility such as Professors, Advisors, Employers, Coaches, and Community or Business Leaders. Have 3 to 5 references. Select people who know your abilities. Ask permission of each reference before you use them as a reference. Assist your references by giving them a copy of your resume-this way they have easy access to your strengths, experience, skills, activities, etc. Paragraph 2: Skills, education, experience, training, achievements, etc. Attend an Advising & Career Center Resume and Cover Letter Workshop. Focus on what you can contribute to the employer - not what they can do for you. Don't exaggerate - be honest and positive. Proofread! Have at least three different people proofread your letter. Keep a copy of every letter you send. Customize each letter for the specific company/position. Make an Appointment with the Advising & Career Center if you would like additional help or for someone to look over your Cover Letter draft. Research yourself, the company, and the position before you write. How do the goods/services they provide impact you personally? Know who does the hiring so you know to whom you should address your cover letter. What opportunities are available for training, advancement, and career growth? Do you want to work for this company? Why? What skills/ tools will you need? How does the position contribute to the organization as a whole? What hours will you work? What are the benefits, salary range, etc.? Do you have the necessary education? Do you have experience in the field or any related experience? Use the College in Colorado Interest Profiler to learn more about yourself.